This interview took place on: 9/20/14. Click here for KJ's Artist Profile page. JFH (John DiBiase): So, to start -- why has the new album (Mental) been delayed from its original April release? KJ-52: Yeah, two things. Well, one--I'm totally independent now. So that's one thing that's changed. JFH (John): Was it Paradigm? Is it still going to be Paradigm? KJ: Yeah. It's basically my manager. KJ: That's all it is, yeah. So it's her and she has distribution. She always acted like a label in a lot of ways. I'll be honest with you, the main reason it got delayed was because I started working with Solomon [Olds]. And the song we did, "Mental," really changed the whole direction of the record. And so we thought "Mental" was a really strong song and we were like, "This is a whole new sound, a whole new energy, why don't we try another one and see if we can duplicate that and that became "Gameface." And then, EP's are the new albums. JFH (John): Yeah. It's 9 songs? KJ: Well, it's technically the 5 new songs and 4 remixes. So it's like a maxi-EP. Most people equate EP's to albums these days anyway. Which, to be honest with you, I'm totally cool with. JFH (John): But does that mean fans will get more music more often? KJ: I think so. I think the main thing is that fans are just inundated with too much music. It's easier to digest 5 songs than 15. Y'know what I'm saying? And it's easier to sell 5 songs than it is 15. JFH (John): That's true. But sometimes when you hear a really good EP, and it's over, you're like "I just want this to keep going." *laughter* I mean, I don't know if that's us being older and we grew up on full albums MORE than just EPs, cuz then [a full album] does feel like an experience. Y'know what I mean? KJ: Absolutely. But, unfortunately, you and I are a dying breed. We're a dying dinosaur that's going the way of the buffalo. Well, the other thing is that, now everything lives on Spotify. So it's just a stream of songs. You don't like it, you just skip to the next one, so the idea of a collective body of work is just harder for people to digest. But the irony is that this EP is the first thing I've done in 15 years that I can literally do every song off of it [live] and it works. I've never had a record where I've been able to do that. KJ: *smiling* I don't know! I think I just accidentally hit jackpot! I think the sound is more congruent to what's going on. The industry has changed. That's the best thing. Especially when it comes to Christian hip hop. I spent 10, 12 years holding people's hands through the genre, cuz I was in places that were not rap-specific places. I feel like I've been in a concentration camp for 15 years and I'm just getting let out! Y'know? Like I don't know how to eat normal food, like I've been living off of berries and twigs and things like that. It's a different world, which is a great thing for me. I just wish it would've been around 15 years ago when I started. JFH (John): Yeah, so what are your thoughts on Lecrae's album hitting number 1 in sales in the country? KJ: I think it's awesome! I posted something up the other day. I said, "His going number 1 should speak to two different industries at the same time. Basically, to the Christian market, it should say 'You've ignored this genre for so long, it's secretly up and past you.' And to the mainstream market, it's saying that 'not all of us want that negativity that you shove out the pike.'" And really, what it's saying to those of us who have done it for so long, is that we're still just doing what we always did, and everyone else is scratching their head, trying to figure out how it happened! Well, while you were doing the same old, same old, we were cultivating this small, little, very faithful, passionate fanbase. But I also think the hip hop generation has grown up. They're more in power now than they used to be. So I see that in a very real way now. 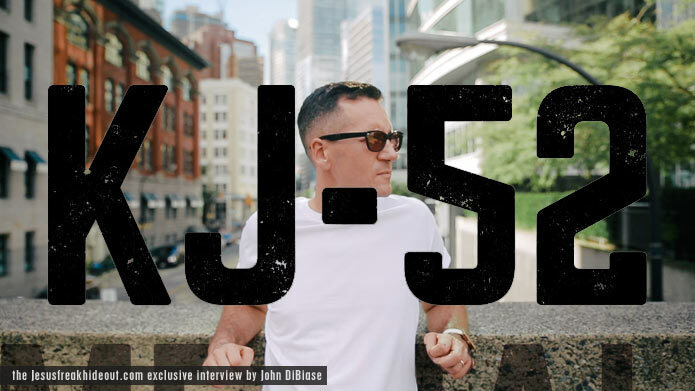 JFH (John): Yeah, I remember when I first got into Christian music in the mid-90's, there wasn't a lot of hip hop, and if there was, it wasn't very good. KJ: Yeah, you had to dig. You had to dig really hard. I know, that's when I got saved. I mean, there's great stuff out there, I just think the Internet just levels the playing field. It just makes it different now. The best way to compare it is just that the music industry was a totalitarian dictatorship. It forced people to go, "this is what you have to like." And now, that regime's been toppled. Now, we do whatever we wanna do. We elect our own leaders. That's what we do. Everything's very tribal in this little genre. JFH (John): Tell me about the song "Fight Music." KJ: Well, that came from the song that I did with Lecrae, originally called "They Like Me." But the problem with that song was you could never do it live. *laughs* Because, one--I needed him there, and two--the production of the beat, while a cool song, just didn't lend itself to a performance. So, to be honest with you, I wanted to remix it myself in a way that I know I could perform it live. But then I also knew that I needed to be able to do it and tell my own story whether Lecrae was there or not. So I took the line that was his opening line, which is the line that everybody always loved, and I made it the chorus. So I basically retooled the song where I knew that it'd work for me. And now that I do it in the set, it goes over amazingly. I think, too, especially in light of things like [the events that took place in] Ferguson, everything that's just going on, these are things that people want to talk about. And there's people--black and white and everything in between--that are passionate about racial issues. That's like the unsung people that don't talk. JFH (John): "Island of the Misfit Toys." How about that? KJ: That song was kind of birthed out of a line that I heard on a movie. It was this movie called The Perks of Being a Wallflower, and there's this little moment in the movie that when the boy--I think his name was Sam--joins the group and the girl--who was in Harry Potter, I can't remember her name--she's like "Welcome to the Island of the Misfit Toys." She's basically saying "You've joined us. We're all a bunch of rejects, but welcome to a place of belonging." KJ: Exactly. And it's such a poignant picture of where people are at; feeling like you're broken, feeling like you're rejected. I wanted to write a song that came from my own story, and then on the chorus, kind of like saying, "I want to hit every possible people group"--which I never did, but--and basically say, "but you are loved." Kind of like saying, "Welcome to the Island of the Misfit Toys, where we find belonging and who Jesus is." I would rather be broken and know that there's someone there to pick me up and fix me, than walk around like I've got it all together. JFH (John): Oh, totally! Yeah. I thought that, when I heard Tedashii's line about [the loss of] his son, I thought "Dang!" That's heavy considering what he went through. JFH (John): How'd you choose who you collaborated with? KJ: Honestly, I usually let the song dictate it. Like, I don't have a list of this, this, this, this and this. It's more like you paint the picture and you've got your primary colors and then you go, "what are some accenting colors that would help paint this picture better?" And so that's usually how it was. So when I did "Mental," I was like, "I could really hear Tedashii on it." It was a big song and I needed somebody with a big presence. When I did "Gameface," I thought of KB, who already kind of worked in that aesthetic and both songs I had on tap but I couldn't finish. I was stuck and it was really Soli who took the idea and, for the lack of a better word, "polished" the diamond. Y'know what I mean? And then same thing when I redid "They Like Me," I had that sorta piece from Propaganda. I had that vocal, spoken word piece that I'd been sitting on and I was thinking "This is going to work so perfect as an intro and a bridge in the song." And then on "Misfit Toys," I had Social Club on there. Like their whole movement is "The Misfits," and it just made sense. JFH (John): How'd you start working with Soli on this record? KJ: Y'know, randomly he tweeted on Twitter one time, like "I think it's time we should start working together." And a bunch of our mutual fans freaked out. I'd known Soli for a while, so it wasn't like we didn't have a relationship. I came to Atlanta and he came by the hotel and I said, "Here's some things I've been tweakin', messing around with." I played him that beat and I said, "I've been stuck on this beat! I can't figure out how to finish it." I had this idea, but I can't think of what I want to do with it! And he just heard the beat and he heard the idea and he goes, "What if we do this and this?" and it was that fast. But you need somebody to ping pong things off of. So the working was great. It was super quick, super painless. We only met once. Everything else was just sending tracks and texting. JFH (John): Cool, yeah, he actually played his last show with Family Force 5 last year here at Uprise Festival. It's great seeing that he's still active with remixing and producing other artists. KJ: Yeah, he's a great bridge guy. Like, he's a good bridge between pop/dance or whatever--whatever that Family Force 5 is--and rap, or pop/dance and pop, y'know what I mean? He's really good at taking the diamond and polishing it. JFH (John): Were you hesitant at all to do a song like "Tonight?" KJ: A little bit. Yeah. It was like one of the first ones I did, but I think for me it was just like, what do I want to say? And this was the best way to say it. KJ: Yeah, to sing it. I started getting into the EDM stuff and I don't want to be David Guetta or something like that, but there's just a cool energy there that I want to tap into. That's really what it came down to. Just a cool energy I wanted to tap into. But I'm a chameleon when it comes to music. I'm just a fan of so many different things. But it goes over well. JFH (John): Any other thoughts on the album? KJ: I think, for a lot of people, it'll make people rediscover me. Because I think for a lot of people, they might have gotten with me at some point in my career and then eventually you move on to another thing, and so I hold this little weird space in a lot of people's lives, but anything you do for fifteen years is a long time--much less Christian rap of all things. So I think in that case, I think this is a record that'll make people come back to why they might have liked me in the first place. But it's a definite update of the sound, and to be honest, like I said, it's the first record I can do every song off of live and it works. And maybe that's the independent game, y'know. You don't have the constraints of all the other things I have to worry about. I'm still here--like death and taxes, you can't get rid of me. JFH (John): Oh, actually -- why the album title, Mental? KJ: It was like the one song that changed the direction of the record, but then I was like, y'know what man? This is the world we live in and it feels like it's going crazy. You need 2 seconds on the news and you'd feel the same way. You feel like the world is going mental. But at the same time, when we take a stand for the things of God, we're treated like we're crazy. So it's like a two-fold deal. And even in the context of biblically, you have to renew your mind everyday to deal with what's going on. Like today, when I missed the turn and I had to go a full hour out of the way to get back here off the turnpike. That was a little mental. I was losin' it. JFH (John): Do you think rock music's dead? KJ: *laughter* As long as there's kids, there will always be Raffi and Barney. That's the truth. JFH (John): There you go. And VeggieTales. KJ: And VeggieTales. Very true. KJ-52's latest album, Mental is available now wherever music is sold!